Death of a Prominent Somerset Man. Hon. C. C. Musselman, one of the prominent and substantial citizens of Somerset, Pa., died on Sunday. Few men in the county were better or more favorably known. He was for several terms a member of the State Legislature; afterwards for a term of six years he was one of the Associate Judges of the courts of Somerset county; at one timne President of the Agricultural Society; he had ever since been the representative of the State Board of Agricultlure, in which body he was recognised as one of its leading members. He took a great interest in the leading enterprises of the vicinity , and was one of the Directors of the Somerset and Cambria railroad. He was entirely a self-made man, and by his energy and intelligance had acquired a handsome competence. Mrs. Dora Jane Myers, 79, a life-long resident of DeWitt county, died in her home in Clinton at 12:45 p.m. Monday. She had been in failing health for some time. Mrs. Myers was born October 7, 1879 in Weldon a daughter of Alexander and Alberia[sic, Elvira] Robey Bird. She was married to Joseph Grant Myers, in Weldon. He preceded her in death. Surviving are four children, Wendell, Emil, Herman, all of Clinton; and Mrs. Velma Sanders, Portland, Oregon. One sister, Mrs. Emma Bennett, Clinton, and 11 granchildren and three great granchildren also survive. Decedent was a member of the Royal Neighbors Lodge and of the Methodist church of Clinton. Funeral services were held in the Reeser-Herington funeral chapel Wednesday at 2:30 p.m. with Rev., Kenneth Know, Methodis minister, officiating. Burial was in Memorial Park cemetery. FROSTBURG - Anna E. Myers, 91, formerly of 80 Washington St., Frostburg, died Saturday, March 20, 1999, at Sacred Heart Hospital. She had been a resident of Frostburg Village Nursing Home for 11 months. Born April 24, 1907, in Frostburg, she was the daughter of the late Philip and Anna (Kroll) Everline. She also was preceded in death by her husband, Cecil Myers; one brother, Harman Everline; three sisters, Margaret Shank, Emma Hodel and Martha Williams; two nephews, Howard Everline and John Everline; and a special friend, Preston Nebil. Mrs. Myers was employed by Berkowitz Shirt Factory and Myers Store. She was an active member of Salem United Church of Christ and the Mizpah Sunday School Class. She was a former member of Eastern Star, Mountain Chapter 15. Surviving are one niece, Joanne Clise and husband William, Frostburg; four nephews, Robert F. Williams and wife Judy, Norfolk, Va., Karl Shank and wife Helen, Canton, Ohio, J. Arlan Shank and wife Lois, Louisville, Ohio, and Robert Everline and wife Margaret, Westernport; and her sister-in-law, Ruth, New Castle, Pa. Friends will be received at the Sowers Funeral Home, P.A., 60 W. Main St., Frostburg, on Sunday from 2 to 4 and 7 to 9 p.m. Services will be conducted at the funeral home on Monday at 1 p.m. with the Rev. Lawrence A. Neumark officiating. Interment will be in Frostburg Memorial Park. Memorial contributions may be directed to Salem United Church of Christ. Woman 103, Dies in Frostburg. Mrs. Anna K. Myers, 103, of 45 Water St., Frostburg, died yesterday in Miners Hospital where she was admitted June 2nd. Born August 21, 1863 in Frostburg, she was a daughter of the late William and Nancy (Bowlin) Thomas. Her husband Nimrod Myers, died in 1930. She was a member of the First Methodist Church, the Van Dyke Bible Class, the Frostburg Republican Club and Mt. Chapter 15, Order of the Eastern Star. Surviving are two daughters, Miss Mabel Myers, at home and Mrs.John W. Anderson, Wayne, Pa. One son, William T. Myers, Lancaster, Ohio, one sister Mrs. David Thomas, Orlando, Fla., four grandchildren and nine great grandchildren. The body is at the Durst Funeral Home, where friends will be received from 3 to 5 and 7 to 9 pm. Serviceswill be conducted tomorrow at 2 pm at the funeral home by Rev. Leonard B. Ransom. Burial will be in Frostburg Memorial Park. Pallbearers will be Earl Brain, James McMorran, Fredrick Morton, Nick Quartuci, Wayne Myers and Reaford Aldridge. Mrs. Anna K. (Kate) Myers, 103, of 45 Water Street, Frostburg, died yesterday in Miners Hospital, where she was admitted June 2. Born August 21, 1863 in Frostburg, she was a daughter of the late William and Nancy(Bowlin) Thomas. Her husband, Nimrod Myers, died in 1930. She was a member of the First Methodist Church, the Van Dyke Bible Class, the Frostburg Republican Club and Mt. Chapter 15, Order of Eastern Star. Surviving are two daughters, Miss Mabel Myers, at home, and Mrs. John W. Anderson, Wayne, Pa.; one son, William T. Myers, Lancaster, Ohio; one sister, Mrs. David Thomas, Orlando, Fla.; four grandchildren and nine great-grandchildren. The body is at the Durst Funeral Home where friends will be received from 3 to 5 and 7 to 9 p.m. Services will be conducted tomorrow at 2 p.m. at the funeral home by Rev. Leonard B. Ranson. Burial will be in Frostburg Memorial Park. Pallbearers will be Earl Brain, James McMorran, Frederick Morton, Nick Quartucci, Wayne Myers and Reaford Aidridge. Eckhart- Mrs. Annie R. Myers, 82, of here, died Friday night at her home. She had been in ill health for six months. A native of Eckhart, she was a daughter of the late Keilly and Mary Logsdon Folk. Her husband, Charles Myers, preceded her in death. Survivors include two daughters, Mrs. Quintella Cunningham and Mrs. Loretta Haggis, both of here; three sons, Floyd Myers, at home; Clement Myers, Rawlings, and George Myers, Frostburg; three brothers, Charles Folk, of here, Roy Myers (sic), Slabtown, and John Folk, Cumberland; three sisters, Mrs. Emma Izzet, Slabtown; Mrs. Edna Rainer, Gilmore; Mrs. Hannah Leatherman, National; five grandchildren and three great-grandchildren. The body is at the Durst Funeral Home. Services will be conducted at the funeral home tomorrow at 2 p.m. by Rev. William Anderson, pastor of the Eckhart Methodist Church. Interment will be in the Eckhart Cemetery. FROSTBURG - Mrs. Bertha Myers, wife of William Myers, 69, died this morning at her home in Turtle Creek, Pa. She was the daughter of the late Louis and Amanda Plummer, Grahamtown. She is survived by seven children, all of Turtle Creek; three brothers, Ernest, Theodore and Walter Plummer, and three sisters, Mrs. Victor DeVore, Mrs. Alfred Hunter, and Mrs. Nellie Fatkin, all of Frostburg. Three brothers in Baltimore, Harry, Joseph and Algie Plummer, also survive. Services will be held Monday at 2 p.m. at the Jobe Funeral Home, Turtle Creek. FORT ASHBY, W.Va. — Bertha L. Myers, 87, a resident of Dawnview Center, Fort Ashby, went to be with the Lord on Monday, Feb. 26, 2001, at Sacred Heart Hospital, Cumberland, Md. Born on Aug. 17, 1913, at Horseshoe, she was a daughter of the late George “Tom” and Julia Ann (Shank) Simpson. She was also preceded in death by her husband, Eugene George Myers, on Feb. 11, 1980; three brothers, five sisters, two infant daughters, and one grandson. Mrs. Myers was a homemaker and was a life long member of the Calvary Assembly of God Church, Fort Ashby, where she taught Sunday school for 32 years. Surviving are four sons, Gilbert E. Myers, Baltimore, Md., G. Delbert Myers, James H. Myers and wife Colleen and R. Bruce Myers and wife Judy, all of Fort Ashby; two daughters, Wilma C. Hart and husband Jim, Struthers, Ohio, and Beverly B. Bly, Bunker Hill; twin sister, Beatrice Hayes and husband Grayson, a resident of Dawnview Center, Fort Ashby; sister-in-law, Pauline Pennington and husband Leonard, Ridgeley; 15 grandchildren and 14 great-grandchildren. Friends may call at the Smith Funeral Home, Keyser, on Wednesday. Funeral services will be conducted at the Calvary Assembly of God Church, Fort Ashby, on Thursday at 11 a.m., with Pastor Wes Beahm officiating. Interment will be in Fort Ashby Cemetery. FROSTBURG- Mrs. Bessie Brode Myers, 85, Euclid, Ohio, widow of Ellsworth Myers, died yesterday at the Belmore Nursing Home in Cleveland, Ohio. She was formerly of here. Born in Frostburg, she was a daughter of the late Conrad and Barbara (Werner) Brode. Surviving are a daughter, Mrs. Doris Cook, Euclid, and a sister, Mrs. Minnie Close, here. The body will be returned to the Hafer-Sowers Funeral Home where friends will be received from 2 until 4 and 7 until 9 p.m. tomorrow. Carl W. Myers, 57, of 920 Center Street, LaVale, died suddenly yesterday at his home. Born in Ft. Ashby, he was a son of the late Dorse and Mary M. (Lease) Myers. He was a Navy veteran of World War II and a member of Mineral Baptist Church, Keyser and of the Brotherhood of Railway Maintenance of Way Employes. Surviving are his wife, Mary E. (Eifert); three brothers, George E. Myers, Ft. Ashby; Russell and Floyd Myers, city; four sisters,Mrs. Bernice Stevens, Baltimore; Miss Susan Myers, city; Mrs. Pauline Pennington, RD 1, Ridgeley and Mrs. Joseph Nelson, Ridgeley. The body is at the Scarpelli Funeral Home. Mrs. Benjamin Myers, aged 82, died at her home at Moscow yesterday morning. She leaves her huband and several sons and daughters. She was a native of Allegany county and lived here all her life. Funeral notice later. The funeral of Mrs. Catherine Myers, who died at Moscow last Wednesday, will take place tomorrow afternoon and interment will be made in Laurel Hill cemetery. Mrs. Myers leaves her husband, Benjamin Myers, her sons, Montgomery, Jacob and Frank, and Beveredge, of Florida, and Joseph of Cumberland, and daughters, Mrs. William Jacobs, Mrs. Guy Ritchie, and Mrs. John Smiley, of Moscow. Frostburg- Cecil B. Myers, 69, of 80 Washington Street, died today in Sacred Heart Hospital, Cumberland, where he was admitted Monday. Mr. Myers was born in Lonaconing, a son of the late Benjamin and Annabelle (McKenzie) Myers. He was a retired grocery store owner, a member of Frostburg United Methodist Church, and Masonic Lodge 99, AF & AM. Survivors include his widow, Anna (Everline) Myers; one brother, E. Benjamin Myers, here, and a number of nieces and nephews. The body is at the Hafer-Sowers Funeral Home. Martinsburg,W Va - Mrs. Charles Myers, member of a prominent Berkeley county family, died here Saturday, aged 62 years. She was a daughter of the late William Ward and is survived by husband and two children, Miss Ida Myers and Bernard Myers. FROSTBURG -- Mrs. Cora Myers, 76, of 61 Linden Street, died yesterday at her home. She lad been in ill health for over a year. Born at Borden Mines, she was a daughter of the late John and Annie (Brode) Johns. Her husband, George Myers, preceded her in death. Mrs. Myers was a retired employe of the Berkowitz Pajama Factory and was a member of Salem United Church of Christ. Surviving are three sisters, are Mrs. Catherine Skidmore and Mrs. Harry C. Williams, both of Frostburg, and Mrs. Russell Brower, Waynesboro, Pa. The body is at the Hafer Funeral Home, 60 West Main Street, where friends will be received today from 7 to 9 p.m and tomorrow from 2 to 4 p. m and 7 to 9 p. m.
MYERS--Mr David B Myers, an old citizen, died at his residence on Friday (31 Dec 1875), from smallpox. He was born at Mercersburg PA on 23 Feb 1819, and moved to Cumberland in 1840. Burial was at the German Lutheran Cemetery. DOD: December 8, 2010 at Somerset Hospital. Spouse: Rocklyn “Rocky” Myers of Somerset. Survived by: husband, Rocklyn “Rocky” Myers of Somerset. The funeral of Mrs. Elizabeth Myers, 73, wife of George H. Myers, who died at 6 p. m. yesterday at her home in Corrigansville, will be held at 2 p.m., tomorrow in St. John's Reformed church at Corrigansville. Burial will be in Greenmont cemetery. Besides her husband, she is survived by the following children: Mary B. Everline, of Frostburg; Mrs. Oscar C. Wolfe and Herbert Myers, Ellerslie; William Myers, Mrs. Bruce Diehl, Corrigansville, and Miss Irene Myers and Bruce Myers, at home. She was a sister of Mrs. Jacob C. Matthews and Conrad Lapp, both of Corrigansville. Funeral services for Mrs. Emily Suter Meyers[sic], 78[? unreadable] years old, who died Wednesday night at the home of her daughter, Mrs. Peter E. Berry, 311 Washington street, will be held at 2:30 o'clock tomorrow afternoon from the home of Mrs. Berry, the Rev. Henry F. Kloman, rector of Emmanuel Protestand Episcopal Church, officiating. The pallbearers will be Clayborne M. Jame, W. Milnor Roberts, Philip J. Arendes, Arthur J. Fitch, J. Thruston Boyd and Ingham Lord. Burial will be in Rose Hill Cemetery. Mrs. Myers, at one time a prominent merchant of Cumberland. Miss Ethel Myers, 16 years old, died at the home of her father, C H Myers, near Berkeley Springs. She was ill with measles and the wind blew something against the house, frightening her so badly that convulsions resulted with mental derangement, her death following. KEYSER - Eugene George Myers, 70, of RD 2, Keyser, was pronounced dead on arrival today at Potomac Valley Hospital, Keyser. Born in Mineral County, he was the son of the late Dorsey and Mary (Lease) Myers. He was a retired employee of Allegany Ballistics Laboratory and was a Navy veteran of World War II. Surviving are his widow, Bertha L. (Simpson) Myers; four sons, Gilbert Myers, Essex, Md., and Delbert Myers, James Myers and Richard Myers, all of RD 2, Keyser; two daughters, Mrs. Wilma Hart, Struthers, Ohio, and Mrs. Beverly Bly, Bunker Hill, W.Va.; two brothers, Russell Myers and Floyd Myers, both of Cumberland; three sisters, Mrs. Daisy Nelson, and Mrs. Pauline Pennington, both of Ridgeley, and Mrs. Susan Myers, Fayetteville, N.C.; 13 grandchildren and two great-grandchildren. Friends will be received in the Rotruck Funeral Home, Keyser, tomorrow and Wednesday. Services will be conducted Thursday at 2 p.m. in the funeral home by Rev. Raymond Kirby. Interment will be in Fort Ashby Cemetery. FROSTBURG—Services for Mrs. Eva (Orndoff) Myers, 64, widow of Pearce Myers, formerly of Mt. Savage, who died Saturday in Johns Hopkins Hospital, Baltimore, will be conducted tomorrow at 2:30 p. m. in the Durst Funeral Home here. Rev. L. T . Moore, of the Mt. Savage Methodist Church, will officiate. Interment will be in Eckhart Cemetery. Among tho survivors are a brother, John Orndoff, Mt, Savage; two sisters, Mrs. John McKenzie, Meyersdale, Pa., and Mrs. Margaret Myers, Eckhart, 24 grandchildren and two great grandchildren. ECKHART —Miss Florence Myers, 71, died yesterday in Sylvan Retreat where she had been a patient 30 years. A native of Eckhart she was a daughter of the late Samuel and Nancy (Harden) Myers. Survivors include a sister, Mrs. Lewis S. Emerick, of here, and a number of nieces and nephews. The body is at the Durst Funeral Home, Frostburg, where the family will receive friends today from 2 to 4 p. m. and 7 to 9 p. m. Services will be conducted in the funeral home tomrrow at 1 p. m. by Rev. Marvin Simpson, pastor of First Baptist Church of Frostburg. Interment will be in the Porter Cemetery at Eckhart. and Elijah Michaels, Ellis Yates and Robert Bennett. George Custer Myers, 72, a former resident, was killed instantly June 23 when struck by a car at Redondo Beach, Calif., where he had resided for 12 years. A native of McCoole, he was a son of the late G.W. and Jennie (Dayton) Myers and had resided here most of his life. Mr. Myers had also resided in Frostburg for a short time. While living there he had worked at various business establishments. Surviving are his widow, Mrs Nettie (Hunter) Myers, two sons, Hunter L. and Frederick Myers, both of Gardena, Calif; a daughter Mrs Virginia Martins, Gardena, a brother Claude Myers, McCoole; three sisters, Mrs. William l. Castle, this city, Mrs. Frederick Rafter, Hagerstown and Mrs. Luther Brill, Baltimore; a nephew Calvin Newman, this city and a grandson, William Myers, this city. Services were held at McMillan Chapel, Redondo Beach. Rev. Floyd Alexander officiated and interment was in Gree Hills Memorial park there. George Henry Myers, 49, died Friday, at his home in Corriganville. He was a son of the late William and Margaret (Clauson) Myers. His wife, Mrs. Elizabeth Lapp Myers, died some years ago. Mr. Myers is survived by the following children, Irene and Bruce, at home; William, Cumberland; Mrs. Mary Everline, Frostburg; Mrs. Oscar Wolfe and Herbert Myers, Ellerslie, and Mrs. Bruce Diehl, Corriganville; and a sister, Mrs. Minerva Rogan, Cumberland. He was a member of St. John's Reformed Church, Corriganville, and of the Knights of Pythias and Ohr Lodge No. 131, A. F.and A. Masons, Cumberland. ELLERSLIE - George Louis Myers, 70, Euless, Texas, formerly of Ellerslie, died Tuesday, Jan. 5, 1993, at Harris Methodist H.E.B. Hospital, Bedford, Texas. Born April 18, 1922, in Ellerslie, he was the son of the late Herbert F. and Mamie Ruth (Lowery) Myers. Mr. Myers was a 1940 graduate of Allegany High School in Cumberland. He worked for one year at the Celanese prior to entering the U.S. Army. He served during World War II as a sergeant in the Signal Corps in the European theater. Following his military service, he attended George Washington University in Washington, D. C., where he earned his bachelors and masters degrees in accounting. He was employed by the Civil Aeronautics Board (CAB) where he worked as an airline account supervisor and later as the CAB field representative for the southwest area. He retired in 1981 in Fort Worth, Texas. He was a member of the Ohr Lodge AF&AM, Cumberland. He is survived by his wife, Jeanne A. (Walker) Myers; a son Donald L. Myers, of Natick, Mass., and two grandchildren, Corey and Jesica. Friends will be received from 7 to 9 p.m. Friday at the Harvey H. Zeigler Funeral Home. Services will be conducted Saturday at 11 a.m. at the funeral home by Rev. Ruth S. Kershner. Interment will be in Rest Lawn Memorial Park. Pallbearers will be Richard Close, John Wolfe, Dr. John Wolfe II, Dr. Joseph Wolfe, Edward McCray, Willion Clauson, and Michael Boyd. Predeceased by: parents; first husband Alvah; son, Alvah H. Coppersmith, Jr.; daughter, Phyllis Ray Coppersmith; brother, William Kelly Spear, Jr.
FROSTBURG - Mrs. Hannah Myers, 81, widow of Rev. John E. Myers, pastor-emeritus of First English Baptist Church. St. Albans, W. Va., died this morning in Morris Memorial Nursing Home, Charleston,. W.Va., where she had been a patient a month. Born in Eckhart, she was a daughter of the late Mr. and Mrs. William H.[sic, "D"] Morgan. Surviving are a brother, George Morgan, of Florida; a sister, Mrs. Bessie Lewis, Frostburg, and a number of nephews and nieces. The body will be at First Baptist Church, St. Albans, until services at 2 p. m. Saturday. Interment will be in a cemetery there. Harry Myers, aged about 80 years, G. A. R. veteran and pensioner, well known in this section, died Wednesday Feb 5, 1913, at the alms house, where he had been staying for the past 2 years. He will be buried in the National cemetery at Grafton today. The body having been sent up this morning by funeral director, H. S. Thompson, he has one brother, F. C. Myers, living in Wheeling. Herbert Franklin Myers, 50, assistant supervisor at the Boys Forestry Camp in Lonaconing, was dead on arrival yesterday at Memorial Hospital. A native of Cumberland, he was a son of the late Jacob and Margaret (Huffman) Myers. He was a member of First Methodist Church, Lonaconing, Farrady Post 24, American Legion, Frostburg, and was a veteran of World War II. Surviving are a son, Herbert R. Myers, Rawlings; two sisters, Mrs. Oscar Tressler, Detroit, Mich., and Mrs. Francis Faherty, Clarksburg, W. Va., and two grandchildren. The body is at the Chapel of the Hill Mortuary in LaVale where friends will be received from 2 until 4 and 7 until 9 p.m. A service will be conducted there tomorrow at 2 p. m. Rev John O. Price will officiate and interment will be in St. Luke's Cemetery. Hilda M. Myers, 89, Oakland, formerly of Aurora, W.Va., died Tuesday, Jan. 24, 1995, at the Cuppett-Weeks Nursing home, Oakland. Born Sept. 20, 1905, in Aurora, she was the daughter of the late David W. and Emma (Lantz) Myers. She was 3 retired manufacturing inspector. She is survived by several nieces and nephews. Friends will he received at the Stewart Funeral home, Oakland, from 7-9 p.m. this evening. A service will be conducted at the funeral home on Friday,Jan. 27, with the Rev. Dennis Mchaffie officiating. Interment will follow in the Aurora Cemetery. The funeral of Jacob Myers of Corrigansville, took place yesterday at Palo Alto, Penna. A delegation from Chosen Friends Lodge, I. O.O. F., of this city, attended the funeral. Mr. Myers had been for many years a member of Chosen Friends' Lodge. LONACONING— James R. Myers, 61, of Buck Hill, died Wednesday night in Ambridge, Pa., where he was employed. A native of Moscow, he was a son of the late Mont and Sarah (Cook) Myers. Prior to going to Ambridge, he had been employed as a coal miner in this area. Surviving are his widow, Mrs. Mary (Johnson) Myers; two sons, James Myers, Shaft, and William Myers, Memphis, Tenn.; four daughters, Mrs. Pearl Cameron, Lonaconing; Mrs. Lester Cameron, Bowling Green; Mrs. Francis Philpot, Shaft, and Miss Karen Myers, at home. Also surviving are two brothers, Joseph Myers, Frostburg; and John Myers, of Ohio; five sisters, Mrs. William Robertson, Nikep; Mrs. Joseph Robertson, Mrs. Clarence Green and Mrs. Clarence Metz, all of Moscow, and Mrs. Harry Miller, Frostburg, and 17 grandchildren. The body is at the Eichhorn Funeral Home where services will be conducted Sunday at 2 p. m. by Rev. C. H. Goshorn, pastor of Lonaconing Presbyterian Church. Interment will be in Laurel Hill Cemetery, Moscow. James R. Myers, 75, of Floral City, FL, died in a nursing home, January 9, 1999. He was born in Aurora, March 6,1923, a son of the late Harold and Margaret (Becker) Myers. He was an employee of TRW Tire Plant in Cleveland, OH. Following his retirement, he and his wife, Beulah Evans Myers, moved to Floral City After her death in 1987, he married Pauline Border who died in March 1998. He was also preceded in death by one brother, Allen "Bus" Myers; and two sisters, Mary McMillan and Nellie McGrath. Surviving are two brothers, Homer Myers and Harold J. Myers, one sister, Jessie Fedorow, all of Aurora. The body was cremated and a memorial service was held in Florida. A memorial service is being planned locally for a later date. The ashes will be returned for burial in the Texas Cemetery, Horse Shoe Run. ECKHART — Jesse Stuart Myers, 62, Parkersburg Road, died yesterday afternoon at his residence following a brief illness. He had been employed by the county road department. Survivors include his widow, the former Miss Nettie Starkey; two daughters, Mrs. Oliver B. Porter, Eckhart, and Miss Marion Myers, at home; three brothers, Patrick and D. Eugene Myers, Cumberland, and O. Myers, Paw Paw, W. Va., and two sisters, Mrs. Argle Crabtree and Mrs. Carlton Parker, Oldtown. The body is at the home where funeral services will be conducted tomorrow, at 2:30 p.m. by Rev. Leonard Wright, of Bowling Green Church of the Nazarene. Interment will take place in Eckhart Cemetery. Frostburg,Md., Nov. 19 — The funeral of Joseph Nimrod Myers, aged 70, 45 South Water street, who died yesterday following seven weeks' illness of heart trouble, will be held Friday afternoon at 3 o'clock from the residence, Rev. J. Luther Neff, pastor of the First M. E. Church, officiating. Burial will be in Allegany cemetery. Mr. Myers was born in Preston county, West Virginia. He came to Frostburg at the age of eight years. He was educated in the local public schools and later in life became a partner in the firm of Myers and Crump Stone Company. He married Miss Anna K. Thomas forty-eight years ago. His widow survives, also two sons,Ellsworth, Cleveland, Ohio, and William Myers, Bedford, Pa.; two daughters, Mrs. John Anderson, Philadelphia, Pa., and Miss Mabel Myers of the home; three brothers, John, Addison, Pa.; James, Cincinnati, Ohio, and Andrew Myers, Pittsburgh. Frostburg, May 18 - Mrs. Laura Eliza (Hamill) Myers, 75, died last night at the home of her grandson, Andrew Fuller, 13 High street, after an illness of six months. Mrs. Myers, the widow of Andrew Myers, a lifelong member of St. Paul's Lutheran Church, is survived by a daughter, Lulu Johnson, Pittsburgh. She was a sister of Thaddeus Hamill, this city. She also leaves one great-granddaughter, Laura Jane Fuller, this city. ELLERSLIE - Mrs. Mamie Ruth Myers, 91, a lifelong resident here, died Monday at Memorial Hospital, Cumberland. Born in Londonderry Township, Bedford County, Pa., on Oct. 2, 1893, she was a daughter of the late Lewis K. Lowery and Emma (Lowery) Lowery. Mrs. Myers was a member of the Palo Alto, Pa., United Methodist Church; the United Church of Christ Ladies Aid Society here; Cumberland Chapter 56, Order of the Eastern Star; Hyndman, Pa., Grange 1954; the Cumberland Senior Citizens, the Golden Arches Club of Cumberland, and the Ladies Auxiliary of the Ellerslie Volunteer Fire Company. She is survived by her husband of 64 years, Herbert F. Myers; one son, George L. Myers, Euless, Tex. ; one sister, Mrs. Mae Reighard, La Vale; one grandchild and two great-grandchildren. Friends may call at the Harvey H. Zeigler Funeral Home, Hyndman, Wednesday from 7 to 9 p.m. and Thursday 2 to 4 and 7 to 9 p.m. Services will be conducted Friday at 2 p.m. at the funeral home by the Rev. Robert Close, the Rev. Allyn L. Ricketts and the Rev. David W. Long. Interment will be in Rest Lawn Memorial Gardens, La Vale. Pallbearers will be Howard Cunningham, Richard Close, Edward McCray, Herbert Myers, Robert Serf and Ken Gingerich. Marguerite L. Myers, 88, of Middletown, DE, formerly of Aurora, died Saturday, July 12, 2008, at the Newark Manor Nursing Home. She was born March 6, 1920, in Rowlesburg, a daughter of the late John A. and Effie G. Rosier Bishop. She was a member of the Aurora United Methodist Church and former member of the United Methodist Women’s group. She attended Rowlesburg School and moved to Baltimore, then Cumberland, and back to Aurora when her father-in-law died. She helped her husband run a used car lot and fanned the Myers family farm. She is survived by one son and spouse, James R. and Carola E. Porras Myers, of Brownsville, TX; one daughter and spouse, Mary K. and Alan R. Teets, of Middletown; one daughter-in-law, Patience Ryan Piersol Myers, of Seabrook, TX; five grandchildren; 12 great-grandchildren; and many nieces and nephews. She was also preceded in death by her husband, Homer S. Myers; one son, Robert L. Myers; one brother, John K; Bishop and his wife Rudell Calhoun Bishop; two sisters, Katherine r. Campbell and her husband, Daniel O. Campbell, and Bernadine V. Poling and her husband, Lloyd C. Poling; two grandsons, Timothy A. Teets and Charles S. Myers; and One daughter-in-law, Judith A. Hardesty Myers. Funeral services will be held at 2 pm today, Wednesday, July 16, at the Aurora United Methodist Church with the Rev. John Foy officiating. Burial will follow in the Aurora Cemetery. Stewart Funeral Home of Oakland Was in charge of the arrangements. ECKHART — Maurice Myers, 81, died yesterday in Miners Hospital, Frostburg, where he had been a patient three weeks. A former mine carpenter, he had retired several years ago. Surviving are his widow, Mrs. Florence (Wilson) Myers; two sons, Elmer M. and Samuel G. Myers, both of Frostburg; two brothers, Frank Myers, Cumberland, and Rev. J. E. Myers, St. Albans, W. Va.; three sisters, Mrs. Lillie Farrady, Frostburg; Mrs. Maud Emerick, Eckhart, and Miss Florence Myers, Cumberland, and three grandchildren. The body will remain at the Hafer Funeral Home, Frostburg until noon Friday when it will be taken to Eckhart Baptist Church for services at 2:30 p. m. .Rev. Brooks Henry, pastor, will officiate and interment will be in Eckhart Cemetery. Milton Henry Meyers, 66, of 12200 Northeast 6th Street, North Miami, Fla., died Thursday in Oliver Manor Nursing Home, North Miami. Born August 18, 1903 in Cumberland, he was the son of the late George H. and Effie (Burkhart) Meyers. Mr. Meyers operated the MGK Motor Company on Glenn Street before moving to Florida six years ago. Surviving are his widow, Virginia (McKenzie) Meyers; three sisters, Mrs. Mary Fremin, Bugalusa, La. ; Mrs. Helen Lease, Baltimore, and Mrs. Elizabeth Rhoe, Cumberland; two brothers, Robert L. Meyers and William Meyers, both of this city, and several nephews and nieces. The body is at the Lithgow Funeral Home 150th Street Chapel, North Miami, where services will be conducted Monday at 1 p. m. Interment will be in Southern Memorial Park, there. MOSCOW— Montezuma Myers, 89, died yesterday at the home of his daughter, Mrs. Joseph Robertson, with whom he resided. A native of Moscow, he was a son of the late Benjamin and Catherine (Green) Myers. A former coal miner, Mr. Myers retired about 30 years ago. He was a member of Barton Methodist Church and of Star Council 37, Junior Order of United American Mechanics, for 60 years. He is survived by his widow, Mrs. Amanda (Dornon) Myers; three sons, Joseph Myers, Frostburg; James Myers, Lonaconing, and John Myers, of Ohio; five daughters, Mrs. Robertson, Mrs. Clarence Green and Mrs. Clarence Metz, all of Moscow; Mrs. William Robertson, Lonaconing, and Mrs. Harry Miller, Frostburg; two sisters, Mrs. Kate Smiley, California, and Mrs. Guy Ritchie, Barton; a brother, Joseph Myers, Cumberland; 40 grandchildren and 68 great-grandchildren. The body will remain at the Boal Funeral Home, Westernport, until 11 a. m. Wednesday when it will be taken to Barton Methodist Church for services at 4 p. m. Rev. Wendell Allen, pastor, will officiate and interment will be in Laurel Hill Cemtery, Moscow. Frostburg - Mrs. Nettie A. Myers, 81, Eckhart, widow of Jesse S. Myers, died yesterday at her residence. A native of LaVale, she was a daughter of the late John and Margaret (Blubaugh) Starkey. Surviving are two daughters, Mrs. Marion L. Wintermyer and Mrs. Bruce Porter, both of Eckhart, and one grandson. Mrs. Myers was the last surviving member of her immediate family. The body is at the Hafer Funeral Home, 60 West Main Street, where friends will be received today 7 to 9 p.m. and tomorrow from 2 to 4 and 7 to 9 p.m.
FROSTBURG - A service for Mrs. Nettie A. Myers, 81, Eckhart, who died Monday, will be conducted at 2 p.m. today at the Hafer Funeral Home by Rev. Leonard Wright and Rev. William Anderson. Burial will be in Eckhart Cemetery. Pallbearers will be Russell Porter, David Wright, Charles G. Martin, John Brode, Floyd and Lehman Wampler. Mrs. Rachel Gertrude Myers, 73, of 8820 Fingerboard Road, Urbana, died Wednesday evening, Sept. 3, at Citizens Nursing Home. She was the widow of Roger H. Myers, who died in March 1982. Born April 1, 1913, in Cresaptown, Mrs. Myers was a daughter of the late Howard and Daisy Grant Darr. Mrs. Myers was a member of the ladies auxiliary to the Urbana Volunteer Fire Co. and she had attended Saint Ignatius of Loyola Catholic Church in Urbana. Surviving are four sons, Howard "Mick" Myers, Roger "Chick" Myers, both of Libertytown, Robert Myers of Mountaindale, Ralph "Mike" Myers of Urbana; two brothers, Leo Darr of Adamstown, Ralph Darr of Boulder, Colo.; one sister, Mary Trittipoe of Frederick; 12 grandchildren; 9 great-grandchildren; and several nieces and nephews. Mrs. Myers was predeceased by a grandson, Randy Myers. The family will receive friends 7-9 p.m. Friday, Sept. 5, and 3-5 and 7-9 p.m. Saturday, Sept. 6, at the Smith, Keeney & Basford Funeral Home, 106 E. Church St., F/ederick. Funeral services will be held 3 p.m. Sunday, Sept. 7, from Etchison Memorial Chapel of the funeral home. The Rev. Thomas T. Polk, pastor of St. Ignatius Loyola Catholic Church, Urbana, will officiate. Interment will be in the Garden of the Cross, Resthaven Memorial Gardens, Frederick. Mr. Roger Hume Myers, 71, who resided at 8820 Fingerboard Road, Frederick, died Friday, March 26, at Frederick Memorial Hospital, after an illness of two weeks. He was the husband of Mrs. Rachel G. Darr Myers. 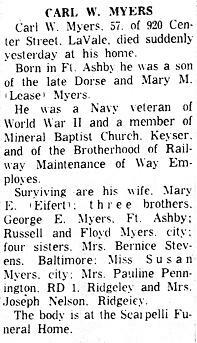 Born Jan. 30, 1911, in Frederick County, Mr. Myers was the son of the late W. Beveridge and Hattie Rebecca Fry Myers. Mr. Myers retired in 1969 from the Frederick County Roads Department as foreman, after 30 years of service. He was a former member of Wesley Chapel United Methodist Church, the Urbana Volunteer Fire Department and the Loyal Order of Moose, No. 371. Surviving, in addition to his wife, are four sons, Howard G. Myers and Roger C. Myers, both of Libertytown, Robert B. Myers of Mountaindale and Ralph M. Myers, Urbana; three brothers, Roy Myers of Urbana, Carlos Myers of Frederick, and Jack Myers of Dover, Del. ; three sisters, Mrs. Louise Moore of Buckeystown, Mrs. Dorothy Darr of Adamstown, and Mrs. Arleen Angleberger of Funkstown; 13 grandchildren, four great-grandchildren, and a number of nieces and nephews. The family will receive friends from 3-5 and 7-9 p.m. Monday, March 29, at the Smith, Keeney & Basford Funeral Home, 106 E. Church St., Frederick. Funeral services will be held at 11 a.m. Tuesday, March 30, from the funeral home. The Rev. Brian T. L. Hunt, Wesley Chapel United Methodist Church, will officiate. Interment will be in Resthaven Memorial Gardens, Frederick. Roy F. Myers (Tobe), 65, of Boswell, died in his home. He was born Jan. 7, 1900, in Bayard, W. Va., a son of the late Frank and Lila Grant Myers. Surviving are his widow, the former Flo E. Clayton; two sons, Donald B. of Greensburg and William H. of Somerset, R.D. 2; three daughters, includng Mrs. Warren (Emma Jane) Mostoller of Boswell, R.D. 2, and Mrs. Leonard (Nancy Mae) Spory of Thomas Mills, and 22 grandchildren. Samuel Myers of Eckhart, died in his 69th year, on Sunday (14 Mar) at Miner's Hospital, Frostburg of elosis of the heart. He was a blacksmith for the Consolidation Coal Co. He is survived by 6 daughters; Mrs William Holsinger of Mt Savage; Mrs William Farraday and Mrs Henry Johnson of Frostburg; Mrs Jefferson Emerick of Cumberland; Mrs Lou Emerick of Somerset, PA; and Miss Florence Myers of Eckhart. Also 4 sons, John, in the seminary at Louisville KY; and Morris, Frank, and Walter Myers of Eckhart. Also, 1 sister, Mrs Ida Thomas of Frostburg; and 5 brothers, James and Andrew of Paris KY; Nimrod Myers of Frostburg; John Myers of Addison PA; and William Myers of Eckhart. Harrisonsburg Va - Mrs. Virginia Myers, wife of Samuel R Myers, died at her home at Tide Spring Fri. She was the daughter of the late Sil*m and Rebecca Sellers and was about 57 years old. Beside her husband, she is survived by one sister and one brother. Walter M. Myers Dies Suddenly of Heart Attack. Former Research Worker at Celanese Succumbs in Frostburg. Frostburg, March 12--Walter M. Myers, 66, 19 Park Avenue, died Sunday morning at 6 o'clock at his home after suffering a heart attack about midnight. A native of Eckhart, he was a son of the late Samuel and Nancy Myers, pioneer residents of this section. He resided in Eckhart until 1920, when he moved to Frostburg. Surviving are his widow, the former Miss Lottie Farrady; two daughters, Miss Ruth Todd, at home; Mrs. Eleanor Rupp, and a granddaughter Susan Ann Rupp, this city. Also the following brothers and sisters; Maurice Myers, Eckhart; Frank C. Myers, Cumberland; the Rev. John E. Myers, pastor of First Baptist Church, St. Albans, W. VA; Mrs. Margaret Emerick and Miss Florence Myers, Cumberland; Mrs. William Holsinger, Mt. Savage; Mrs. Carrie Johnson and Mrs. Lillie Farrady, Frostburg, and Mrs. Lewis Emerick, Eckhart. Mr. Myers, who had been employed in the research department of the Celanese plant for fifteen years, was forced to retire last August on account of failing health, his condition became aggravated by an attack of pneumonia at that time. He spent most of his spare time at gardening and had all his seeds ordered for the coming season and was discussing his plans for a Victory garden Saturday evening at 11 o'clock while taking lunch at home with members of his family. He was stricken after retiring. Mr. Myers was affiliated with First Methodist Church. Ziegler Funeral Home, Hyndman, Pa., from 10 a. m. until the time of the funeral tomorrow. Mrs. Virginia Mytinger, widow of Tobias Mytinger, who died about four years ago, died at her home here about noon Monday, in the 83rd year of her age. She was born in Winchester and came here when very young, probably about 80 years ago. She is survived by the following children: Mrs. Thos. Athey, of Brunswick, Mrs. W. C. Parker, Misses Edmonia, Elizabeth, Nellie, Myrtle and William, Charles and Howard of this place. Mrs. Mytinger was one of a family of ten children.